At the beginning of each KEEN session, all athletes and their coaches warm up as a large group and then pursue individual activities that are tailored solely to the needs of the athlete. Our core program, “KEEN Sports” takes place in a gym with a variety of sports equipment available. Athletes and coaches may throw a basketball or kick a soccer ball, or they may take a walk around an outdoor track. Many athletes love to bounce on our large therapy balls, and others enjoy speeding across the floor on our 4-wheeled scooter boards. In addition to KEEN Sports, affiliates may offer other programs including KEEN Swim, which brings the KEEN formula to the pool, KEEN Tennis, KEEN Bowling, KEEN Fit, and even KEEN Music. Such diverse activities as Tai-Kwan-Do and Yoga have been adapted to fit KEEN’s approach. Check with your local affiliate to see what programs are offered in your area. Each session ends with “Prouds.” Everyone comes together in a circle and shares with the group what they did that day that made them very Proud. Participants literally go out dancing to such great tunes as the Hokey-Pokey or the Macarena. Athletes burn energy, meet and interact with new volunteers, see old friends, and then rejoin their parents, who have had some precious respite time. At the end of the session, it’s hard to tell who has had more fun – the athletes or their coaches. 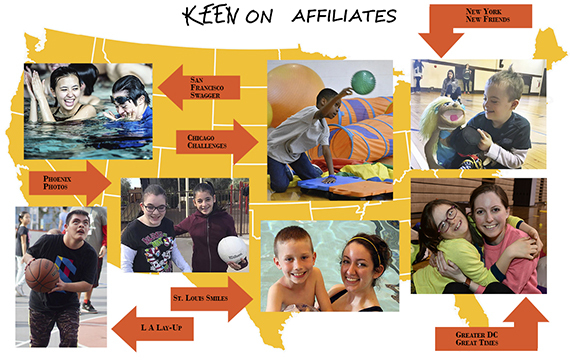 To learn more about specific KEEN programs, check the link below to the KEEN in your area.